Stanhope Village was an existing shopping centre comprised of two separate retail buildings. The redesign has seen the centre become interconnected through a redeveloped mall plan, and expanded through a new extension. The result is a thriving retail hub with a striking visual presence. Stanhope Village is a mid-level shopping centre located in Sydney. It originally comprised two individual retail blocks with the headline tenants of Coles and K Mart. An open plaza, with a fast-food dining tenancy and a children’s play area, sat in-between the two buildings. A further divide was created by each block having its own entrance. The design team were tasked to assist in the planning of a retail connection which would join the two very different existing buildings, as well as upgrade the existing large internal courts located in front of each building. With the inclusion of a mall extension to accommodate a new Aldi tenancy, the result was the formation of a horseshoe mall plan. The new plan allowed for connections to the major common on-grade carpark at each end, as well as achieving a strong linear presentation to the street. The retail connection included a new internal food court and retail precinct. This added a vibrant retail space, as well as resolving the previous issues of connection between the disparate buildings. The design also considered and created strong and interesting entries into the new mall extension from the carparks and the street. The revival of the centre is immediately evident from the street. 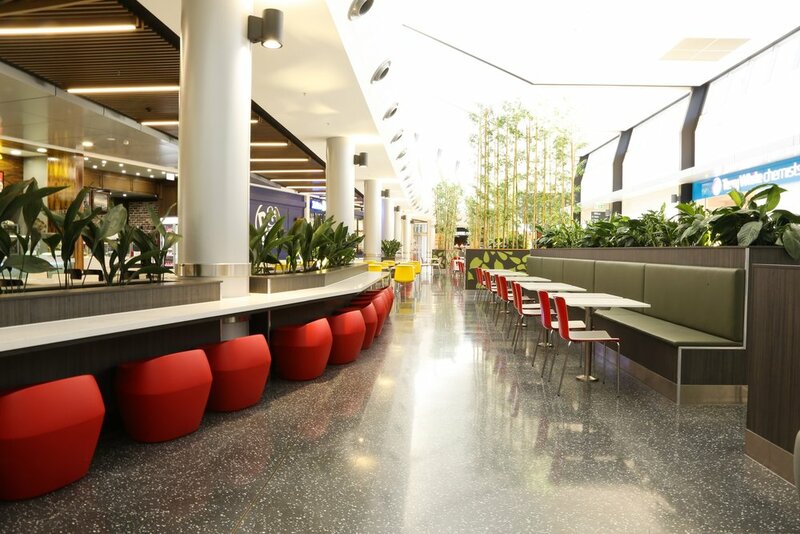 The street frontage was transformed into an alfresco dining edge, connecting through to the new food court and retail precinct. Consistent imagery was used throughout the centre to maintain visual continuity through the customer journey. This included the application of laser cut perforated aluminium panels in a leaf pattern, and a subtle ‘watermark’ leaf pattern on the main food court bulkhead. This internal imagery was continued on the exterior of the centre. The striking leaf pattern in the perforated screens was conceived as representing the leafy, semi-rural environment in which the centre is located. With the selection of a strong colour palette, as well as the creation of a new logo by the client, the centre now has a strong and arresting presence. It has become a great example of infill development where the whole becomes more than the sum of its parts.